A few wispy clouds hang listlessly in a deep blue sky. I need a hat now that my numbered hairs are so short. How easy to feel cared for on a day like this as I walk along the beach. With salt on my lips and sand on my feet, I return to a house shut down to keep the heat out. How easy to rejoice. How easy to send this peace out on my breath. I am so happy. My ego is so happy. My ego tells me that my Dharma practice is all about me. It is about wanting my happiness, my peace of mind, the ripening of my good karma. If I need to send a thought out to others, then it is a small price to pay. In any case, says my ego, if I say my prayers then my teachers will be happy with me and give me their attention. My ego says that its happiness and mine are one and the same thing. Look far ahead. “Well,” says my chronically dissatisfied ego, “I would really feel happier if we could attain the higher levels of the form realm.” So now I need to work toward a good rebirth. My ego is even happy to put up with meditation. Meditating on the emptiness of space is enough to give us the power to reach higher levels of meditative concentration. More meditation, more concentration and it can even reach the formless realms. No blatant suffering to worry about. Amazing power. Bliss out. Happy ego. “Not good enough,” complains my ego. “I want complete peace.” So now we can tolerate all sorts of difficulties, even practicing compassion to generate the merit to attain enlightenment. Our minds are vast and my ego is in a hurry. It squeezes me as much as possible. “Being relaxed is the same as being lazy,” says this unrelenting ego. How absurd! My ego, which wants peace, will not let me be peaceful. I’m beginning to think I would rather get rid of this dictator anyway. Don’t squeeze yourself, say the Kadampa geshes. My ego does not like this, but when I step away from the dictatorship of this relentless ego of mine, I breathe a sigh of relief. One day my ego will become stuck. It will tolerate everything except its own annihilation. And me? Well, I have learnt a lot even if my motivation was rather flawed. In particular I have learned how deep and subtle this ego can be, how easily it fools me into thinking I am being altruistic when I am being self-seeking, or wise when I pretend knowledge, or full of realizations when I am foolishly faking. 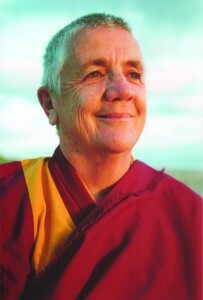 In Lama Zopa Rinpoche’s words: “With a vast, brave mind, think, ‘I’m going to do all this. Even if it takes many, many years, I’m going to do it.’” What I am learning is that this vast brave mind is much better off without its tyrannical ego. 2From Kadampa Teachings by Kyabje Lama Zopa Rinpoche. 3From Kadampa Teachings by Kyabje Lama Zopa Rinpoche.